Medic Alert (MedicAlert®) is an emergency identification system for people with hidden conditions. Wearing a Medic Alert bracelet or necklace can save your life. 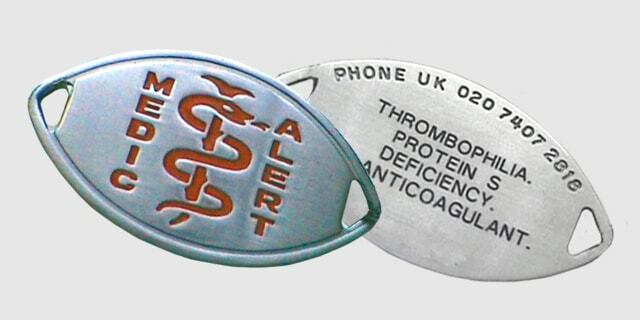 It has an internationally recognised medical symbol on one side and on the other your medical condition, personal identification number and Medic Alert’s 24 hour emergency number. When needed, a first-aider, doctor or other medical professional can immediately get vital information by a telephone call from anywhere in the world. Medic Alert will pass on information from records that include your name, your medical conditions, contact details for your doctor and your family and anything else that you feel is important. Records are updated each year to ensure details stay up to date. It communicates all of your special medical needs quickly and accurately when and where it counts. Medic Alert is a non-profit making registered charity. It was originally founded in America in 1956 by Dr M Collins but is now international with affiliates established in 22 countries protecting over 4 million members. It is supported in the British Isles and Ireland by Lions Clubs and by funds raised by members. All of the revenue is used to benefit members. A stainless steel bracelet currently costs £20.95. Membership costs £32 per year. Silver and Gold bracelets and necklaces are also available. However if you are unable to afford this then you will find them sympathetic to your needs and provide the service free of charge. On the other hand, if you can afford more then please make a donation. Contact Medic Alert Foundation at their London Office and ask for an application form to be sent to you. They have made the application process easier now because it is no longer necessary to ask your doctor to sign the completed form before you return it to Medic Alert. We are happy to provide links to charitable sites and have details of various items for sale in our products and services sections. However we do not endorse any products, services or treatments. We do not earn any commission on sales referrals from this page. All trademarks and registered trademarks shown on our web site are acknowledged and are the property of their respective owners.